Emperor scorpions are exciting and charming creatures, and make an unusual pet that is bound to be a conversation piece. However it is this very uniqueness that means that most of us are unaware of how to go about emperor scorpion care – it is hardly common knowledge. If this is your first time dealing with an emperor scorpion then, here is how best to look after them. Firstly, keep your scorpion in a ventilated glass or plastic tank with a secure lid. You will also need to install a heat mat and thermostat in order to monitor the temperature and keep it at about 25 degrees (place the thermostat over the mat). Also fit a thermometer and keep it at 25 degrees. Next, cover the ground with a layer of substrate, cocoa fibre makes a good choice. Keep the tank and the soil moist as scorpions are used to humidity in the wild (keep it at around 60-70%). Also avoid bright light. While emperor scorpions are fairly clean creatures, you will also need to disinfect their habitat around every three months. The next aspect of emperor scorpion care is their diet, which is fairly simple. Scorpions are insectivores and as such will eat live crickets, locusts and mealworms (which is fascinating to watch). These can be purchased from many pet shops or online and you should use tongs to feed them. Scorpions do not eat every day and can go for a week without wanting food – particularly before and after moulting. Offer your scorpion food and it will let you know if it is hungry or not. 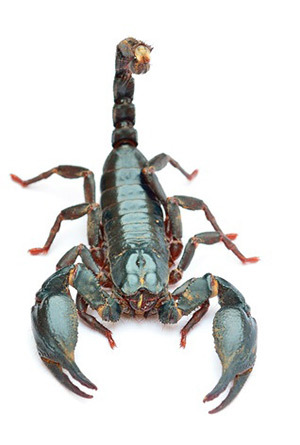 Finally, as emperor scorpions can bite and sting, this can add a tricky element to emperor scorpion care. If you should need to move your scorpion – for example in order to disinfect the tank – then you should coax it into a separate container using tongs. Some people will feel confident enough to lift the scorpion by holding it below the sting, but many other may be squeamish to try this.